Seiser Alm (Alpe di Suisi) is the largest Alpine pasture in Europe. Surrounded by the Dolomites and the Schlern, it is a beautiful location for walking. Seiser Alm (or Alpe di Suisi, as it is known in Italian), is the largest alpine pasture in Europe. Situated in the Trentino region of northern Italy, Seiser Alm is surrounded by the peaks of the Dolomites. It is also adjacent to the Schlern region; which is dominated by one of South Tyrol’s most famous landmarks, the mighty peaks of Mt. Schlern (2,563m/8,409ft, also called Sciliar in Italian). The varied terrain lends itself well to a wide range of outdoor pursuits and walking is incredibly popular during the warmer months, thanks to the lush meadows, prolific wildflower displays and mountain backdrop. The Alpe di Suisi pasture is ideal for long, relaxing strolls; or there are a number of more challenging routes to have a go at, especially around Mt. Schlern. Climbing enthusiasts will appreciate the network of via ferrate (‘iron roads’) that lead exciting paths along exposed mountain ridges and vertical rock faces. Both German and Italian are spoken here, but German is by far the more predominant language, and the region has a very Austrian-influenced ambiance. The area consists of a number of small, picturesque villages; and the two main communities are Kastelruth (Castelrotto), which is a typically alpine town with a historic centre and the third tallest church tower in South Tyrol; and Völs am Schlern (Fiè allo Sciliar), which is slightly smaller, but still caters well for travellers. Seiser Alm and the Schlern region are extremely popular in the winter months, thanks largely to the range of winter sports prevalent in the region, and although they still remain relatively bustling in the summer months, the atmosphere is more laid-back; providing a good balance of liveliness and tranquillity! There are 350km (217mi) of walking paths in the Seiser Alm and the Schlern area combined; with trails ranging from easy (suitable for even young children) to challenging. A particular highlight for anyone visiting Seiser Alm are the annual floral displays. Walkers arriving between mid-June to mid-July will be treated to the sight of the area’s most remarkable wildflowers in full bloom. There are many rare varieties of flora on display during this time, both in the meadows and upon the mountains themselves, and the scenery is spectacular. In terms of popular hiking routes, the Hans & Paula Steger path is a particularly straightforward, scenic themed trail. It is 4.5km (2.8mi) long, and starts at Compaccio (Compatsch in German), at marking number 30. It takes roughly over one hour to reach the end point – Saltria. 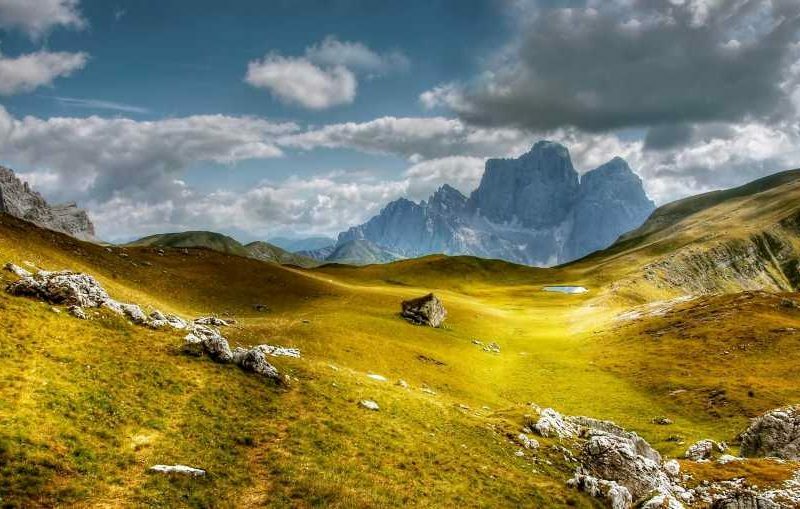 Alternatively, the hiking route from Saltria to the Rifugio Molignon mountain hut is a little more arduous, but passes through some beautiful scenery, including rolling alpine pastures and forests. Mt. Schlern is one of the region’s best-known landmarks and there are many walking trails in the area. The Compaccio – Saltner Mountain Hut route is a popular choice and takes roughly 3 hours to ascend, with a 600m (1,969ft) altitude difference. As with many of the steeper routes in this area, it does require a level of physical fitness to complete. Unsurprisingly, there are plenty of outdoor pursuits on offer in the Seiser Alm and Schlern region. Climbing and mountaineering are both popular of course, and there are a number of indoor- and outdoor climbing centres in the region; ideal for those who want to brush up on their technical skills before tackling the mountains. There are also a number of Via Ferrate; fixed rope routes that lead across rock faces and ridges. These are not for the faint-hearted, but provide remarkable views of the surrounding landscape. Mountain biking is also a key activity in the area, and there are plenty of mountain biking trails (including some of the most demanding routes in the country) in and around Seiser Alm. If the weather proves to be not quite as sunny as desired, then a visit to Bolzano (Bozen), South Tyrol’s capital city, is an excellent way to spend a rainy day. It’s approximately 40km (25mi) from the area, and there are regular buses that run directly to the city. There are a number of museums, including the South Tyrol Museum of Archaeology and Museum of Nature, plus several great restaurants and cafes, serving up delicious regional dishes. If you’re arriving by air, the nearest airports are at Innsbruck (about 1 hour and 30 min.) and Verona (2 hours). Alternatively, there is the option to catch a connecting flight to the local airport at Bolzano (Bozen). From Bolzano, there are regular buses to the Seiser Alm & Schlern region. Driving into the area is a little more complicated, as there are strict traffic regulations in the area. Unless your accommodation is situated within the Alpine pasture (Seiser Alm/Alpe di Suisi), you’re not allowed to bring your car into the area, in order to help conserve the natural beauty. However, the cable car at Siusi provides an easy (not to mention scenic) way to reach Seiser Alm.